C. Nesyan is beaming when he talks about his son. Niksan is 19 and starting his second year at James College of Engineering. 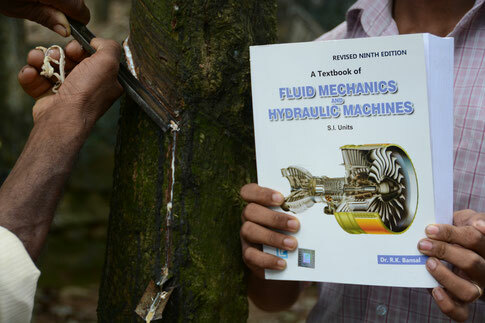 The four-year course in mechanical engineering will cost Rs 200,000 which includes tuition and exam fees, costs for books, transport and the required college uniform. It’s a lot of money for Nesyan who is a rubber tapper and earns about Rs 12,000 a month. In the yard behind the house his wife, Pushpalila, keeps six cows. Three are milking at present, yielding 15 litres a day. Pushpalila gets Rs 30 per litre and she sells the cow dung as well. But it’s the Fair Trade education grant that really helps with Niksan’s college fees. The Fair Trade committee is strict: to be eligible a student has to provide a detailed bill from the college and do well academically – only with marks above 60% the annual grant will be given. For a course like the one Niksan takes the joint body has just raised the grant from Rs 8,000 to 10,000 a year. A graduation course grant comes to Rs 3,125 p.a., a nursing course Rs 5,000 p.a.. Students can be given a grant every term and if several children of one family attend further education, each is eligible. Nesyan knows the rules by heart, next year his daughter wants to go to college too. Nipsy is 17 and in her senior year at school. She too wants to study engineering. Niksan’s college is in Nagercoil, about 40km from New Ambadi. He takes the college bus at 7.15 am in the morning, his classes start at 9 am and run until 4.30 pm. He’s home by 6.30 pm and has to do two to three hours of homework at night. Niksan is very relieved that his grant for the second year has been approved. He attended a Tamil medium school and struggled in his first year at college because all classes are taught in English. But his language skills have improved and he enjoys learning. Once he’s got his degree Niksan wants to work abroad where he thinks he will be able to earn more money. He realises that despite the Fair Trade grant, sending him and from next year his sister to college is putting a heavy burden on the family. His father says he will have to apply for an interest free loan from the joint body and he will take a loan against his retirement fund if needed – whatever it takes, his kids will get an education. The grants and interest free loans financed through the Fair Trade premium make the life of Nesyan just that little bit easier. Shymala and her granddaughter Roopa are living in one of the so- called 'line rooms' in the New Ambadi rubber plantation. These living quarters are small, but nevertheless much in demand by the workers: after all, every units has a power supply, piped water, and a toilet. Furthermore, there is a small garden attached to each unit, which allows families to grow vegetables and keep chickens for their own requirements. Hence there is even a waiting list for these line rooms, as the alternative is to rent expensive accommodation in one of the surrounding villages. Shymala is working in the latex factory which belongs to the plantation. She is a trade union leader, not only for the workers on the plantation but also for the whole district. In addition, Shymala is a member of the joint body, i.e. the committee which was put in place when New Ambadi made the first sales of natural rubber under Fair Trade conditions. The latex supplied was used for the manufacture of Fairly Traded sports balls in Pakistan. The joint body meets on a regular basis. Decisions are recorded in a minute book. One of the decisions which has been made is to save up further Fair Trade payments, so as to collect enough money to establish an educational fund to support the further education of plantation children. Even though education in India is supposedly 'free', children only really have the chance of a better future if they have had some higher education at a private institution. 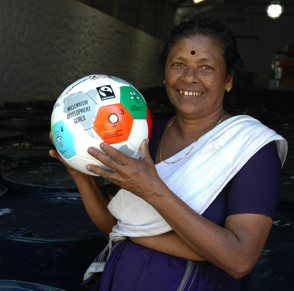 At least 90 tonnes of rubber have to be sold in order for the fund to be large enough to finance a few scholarships. Shymala's hope is that Roopa will be one of the first beneficiaries ‒ her hope is that she will train to become a nurse. But the three-year course costs more than EUR 4000 ‒ a sum which she could never afford from her income as a factory worker. A second big achievement of the plantation is its certification with the Forest Stewardship Council (FSC) ‒ the monitoring system for responsible forest management, which, in this instance, monitors the environmentally-sound production of natural rubber. It is one of the key principles of the concept of Fair Trade that the ‘recipients’ of the Fair price, or Fair Trade premium, are absolutely free in their decision on how they spend the extra income. In the case of the Fair Rubber Association the ‘recipients’ are the farmers and workers of our supplier partners The role of the FRA is to ensure that its members pay the correct Fair Trade premium, that it reaches the correct suppliers - and later on to check that this key principle was followed, i.e. the recipients decided the use of the premium: Therefore we don’t just check the account books (easy, as the Fair Trade premium goes to a separate account as far as plantation suppliers are concerned). More importantly: we look at the minute book of the joint body, i.e. the committee made up of worker representatives (and some from the management) to see who took what decision when. Long experience show that the workers themselves know best what they need/want most. Nevertheless: Things can go wrong in unexpected ways and despite of the best intentions: One joint body came up with a scheme to financially support bright students for further studies: Applicants were required to graduate from high school with excellent grades, and following that their progress at college was monitored year after year. Only if sufficient credits were earned, was the stipend continued. So what could go wrong? Well, as it turns out, even hard earned college degrees don’t come with a job guarantee. There may be too many graduates of a particular subject (engineering seems to be an oversubscribed course), and the teaching of some colleges may simply not be good enough/not prepare their students well enough for work life afterwards. We have heard from one young man who failed to find a job – and regrettably there is nothing we (and presumably the joint body) can do. Except, perhaps, review the strategy overall: Maybe stipends should be used to encourage vocational training courses instead of purely academic ones? That’s one idea the supplier partner came up with – and we can only hope that they get it right and future disappointment of ‘successful graduates’ can be avoided.